We lined up for the Clifton Caboose 5K on Saturday evening just as the kids’ 1-miler was finishing. The first little dudes to finish tore down the road, red-faced and wheezing, using every last bit of energy in their little bodies to propel themselves toward the finish line. They weren’t thinking about the humidity, or the fact that it was raining, or how their legs were tired from the hilly course, or whether they’d net a PR. They were just running their little hearts out, and when race volunteers handed them blue finisher’s ribbons, they grinned like they’d won the lottery. Could there be any better motivation? By the time the 5K started at about 6:30 p.m., I felt I had little choice but to try to follow suit, shedding my expectations and internal trash-talking and just running my little heart out. First, a little background: I found this friendly race in the adorable, historic town of Clifton, Va., through Race Director Gary Anderson, who found this blog after suffering a nearly identical wrist break, wrist surgery and post-surgery recovery to mine last February. Anderson invited me and Steve to Clifton months ago, back when I assumed my wrist break would be a distant memory by June 12. 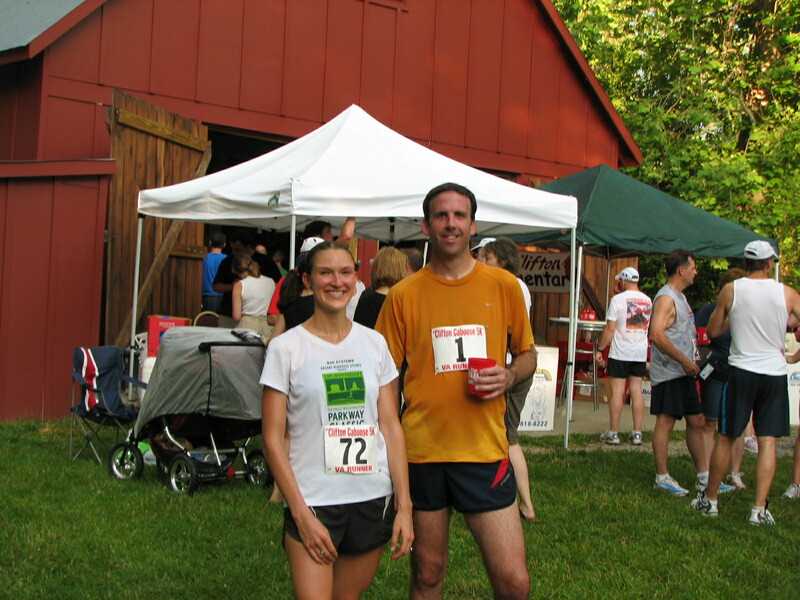 Posing with Gary Anderson in front of the big red barn post-race. No splints or casts in sight! Can I tell you how wonderful this little race was? Pre-race packet pickup and the post-race party took place in a red barn owned by the Clifton Betterment Association, giving it a comfortable, small-town feel before the race even began. Saturday was a steamy day with thunderstorms in the forecast, but the only rain to speak of was a slight drizzle before the race. Anderson warned us before the race that the out-and-back course was hilly and challenging, with a long uphill on the way out, a steep one right before the turnaround and some rollers on the way back. He was right on all counts. But it was also lovely, on a quiet, leafy country road with scenery pretty enough to take one’s mind of the uphill. And having been warned, the hills weren’t too bad—just bad enough to be glad you train on some serious quad-busters. Like any out-and-back course, it was fun watching the speedsters zoom by after the turnaround. And despite its small size (I think I recall volunteers saying about 400 people ran the race), there were some speedsters, with the winners holding sub-six-minute-mile pace.I finished in 24:30 (gun time; I clocked 24:19)—not my best time, but far from my worst, especially considering the weather and the hills. Steve wasn’t in the racing mood, so in a rare treat, he ran with me. 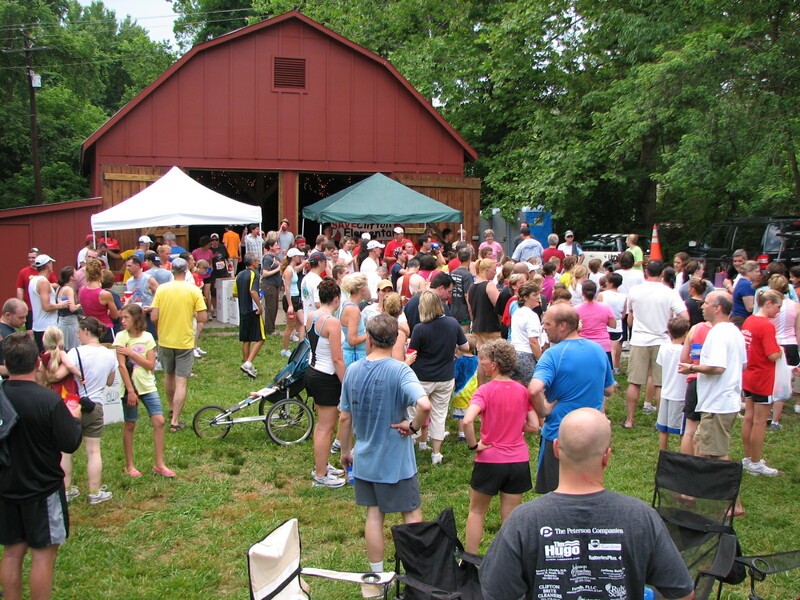 The best part of the race is the charming post-race party back at the big red barn. 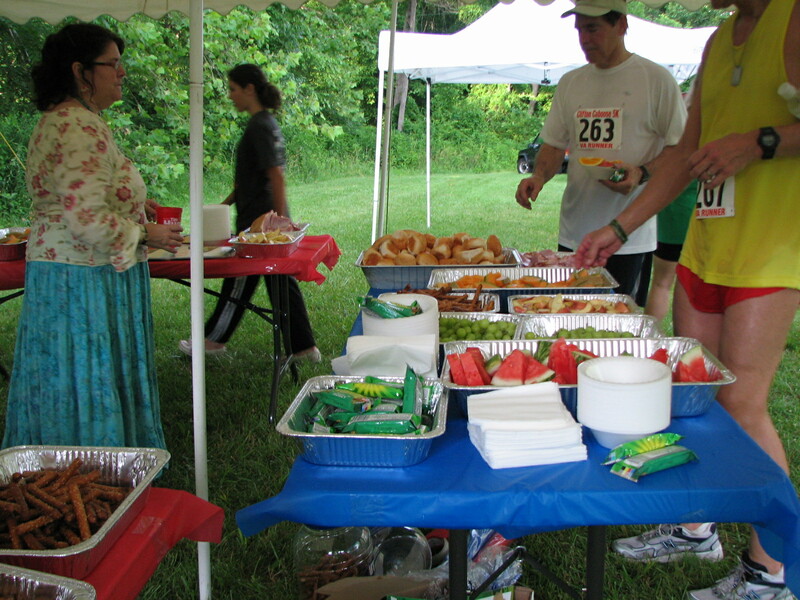 Post-race munchies mostly consisted of vats of fresh fruit, which I loaded up on. Steve headed for the keg of Sierra Nevada—not bad for free beer offerings, no? Big vats of fruit=heaven after a hilly race on a steamy night! I was having so much fun listening to the band playing inside the barn and chatting with the lucky residents of this cool little town, I almost missed it when my name was called during the awards ceremony—I’d won my age group! I immediately put my medal around my neck, grinning like I’d won the lottery. Anderson joked that I now have some hardware to go with my hardware, referring to the titanium plate in my wrist. Biggest surprise of the night: hearing my name called during the awards ceremony for winning the 30-39 women's age group! 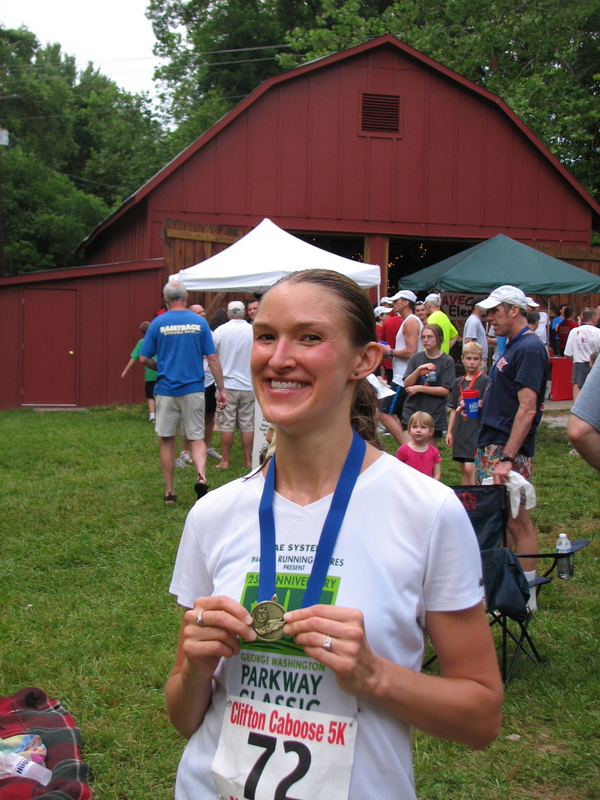 Hard to feel too bad about running 24 minutes and change when someone gives you a medal! A friend who saw my photos commented that it looked like the most charming athletic event she’d ever seen. I’m inclined to agree, and plan to return next year. You know—to defend my title and all. Post-race party at the big red barn. Other motivators: Though I wasn’t quite confident enough in my swimming to tackle the 1-Mile Chesapeake Bay Bridge Swim Sunday, which I’d signed up for pre-wrist-break, I did swim a 3,000-yard workout Sunday without working in any kick sets—and it felt great! I also got a boost from running well in the heat and humidity—a major confidence-booster before I start training for the Rock ‘n’ Roll Virginia Beach Half Marathon over Labor Day weekend. So glad you came out and that you had a good time! Excellent! Congratulations Amy. I will have to add this to my to-do list! Great report, and congratulations on the AG win, I like the comment about coming back to defend your title. Good course, a lot of hills at the start but no killers. I just managed an AG award (50-59) coming in second with a time of 21:24. 3rd overall female was right behind me, what a motivator! There was a KEG of Sierra Nevada?! Oh man, Dustin is gonna be a little upset we missed this one…. Congrats on the award too! !